Cream puffs (a.k.a. profiteroles) filled with a spiced pumpkin cream and topped with a buttery maple-caramel sauce. 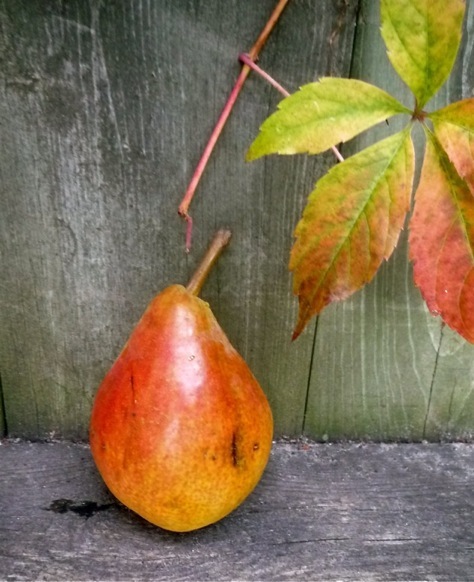 When I want to make an autumn dessert, I think about seasonally appropriate ingredients such as apples, pears, caramel and of course, pumpkin. Pumpkin pie is a staple at most Thanksgiving tables and spiced pumpkin is popular in everything from lattes to ice cream. As a bonus, scientists have long known that the scent of pumpkin pie is an aphrodisiac so it’s the perfect finale to a romantic dinner. If you’re looking for something a little different from pie, these cream puffs (a.k.a. profiteroles) fit the bill perfectly. The pumpkin-cream filling has all the flavours of classic pumpkin pie and the maple-caramel sauce is a decadent and delicious topping (which is also great on ice cream!). The recipe has a number of steps but none are difficult and everything can be prepared in advance and assembled at the end of the meal. 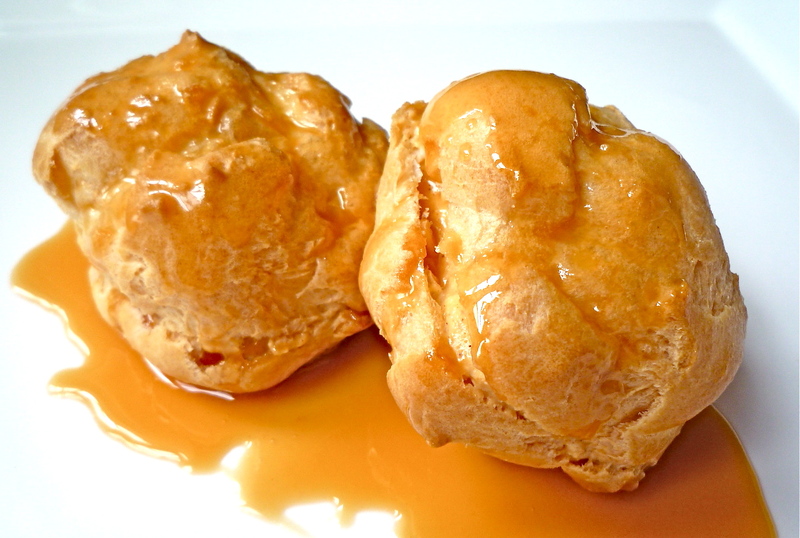 Click here to see the recipe from Suite 101.com: Pumpkin Cream Puffs with Maple-Caramel Sauce. If there is one flavour that really says ‘autumn’ it’s pumpkin. Pumpkin pie is a staple at Thanksgiving and in the past few years I’ve seen everything from pumpkin fudge to ice cream once fall arrives. Some coffee shops even make pumpkin lattes. 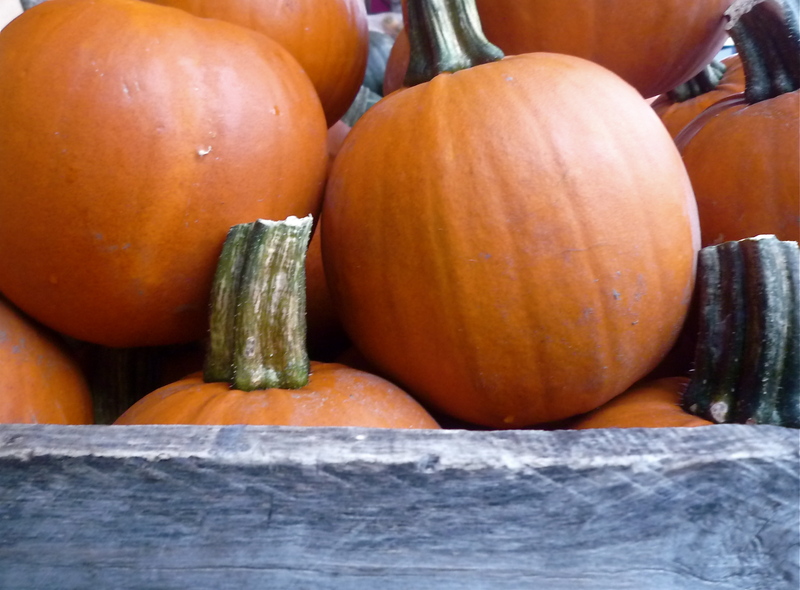 Combined with warming spices such as cinnamon, nutmeg and allspice, pumpkin is a delicious seasonal treat. To make things easy, I use canned pumpkin puree instead of fresh pumpkin for this recipe. While fresh pie pumpkins can certainly be used, the quality of the finished product can vary due to the water content of different pumpkins (for a guideline on how to prepare puree from pie pumpkins, check out How to Prepare Fresh Pumpkins for Baking). If you’re using canned pumpkin, make sure it’s labelled as pumpkin puree and not pumpkin pie filling, which already has spices added. To make big, puffy bakery-style muffins, fill the muffin tins up almost to the top. Make sure you grease the top of the tin so that the muffin tops don’t stick. If the muffins ‘grow’ together during baking, just cut them apart with a knife. Preheat oven to 350 degrees Fahrenheit. Grease muffin tin (including top of tin) and set aside. In a large mixing bowl, add flour, baking powder, baking soda, salt, sugar and spices. Stir with a fork until thoroughly combined. Add pumpkin puree, oil and eggs, and stir into the dry ingredients until smooth. Gently fold in nuts until distributed throughout batter. To make topping: In a small bowl, stir together sugar and cinnamon. Reserve chopped nuts in a separate bowl. Spoon batter into greased muffin cups, filling them to about ½” from the top of the cups. 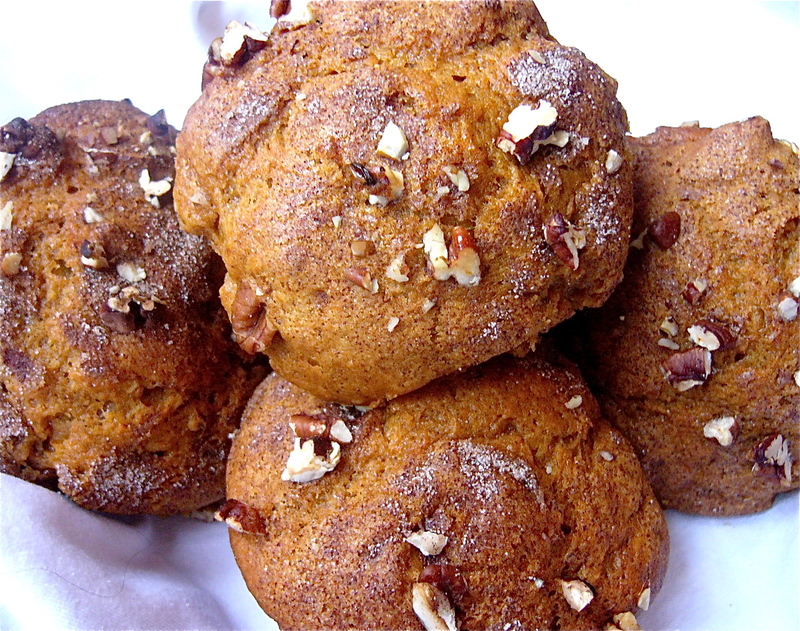 Sprinkle the batter of each muffin with cinnamon/sugar mixture and a spoonful of chopped nuts. Bake muffins for 25 to 30 minutes or until a knife inserted in the middle comes out clean. Remove muffin tin from the oven and let cool at least 15 minutes before removing the muffins. It’s finally fall and I couldn’t be happier. Sure summer is fun, with warm weather, lazy days at the beach and barbecues with friends. But fall is my favourite season with the brilliant foliage, rich fall fashions, crisp weather and of course, the food. Many passionate home cooks consider fall the kick off to the ‘cooking season’. Once the weather cools, we can resume baking, roasting and braising. The markets are piled high with produce and we crave hearty soups and stews after a vigorous afternoon of leaf raking or a hike in the park. 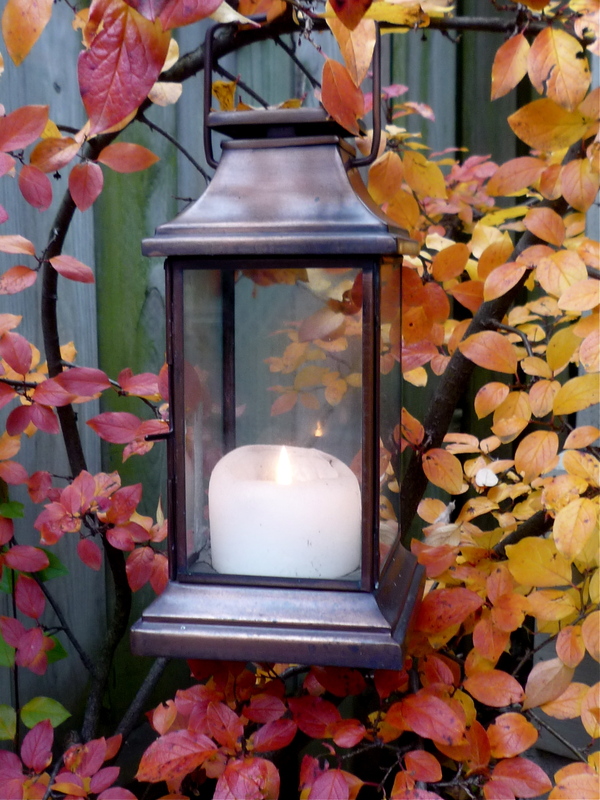 It’s a time to light the fireplace, prepare a rustic dinner and linger at the table with friends. 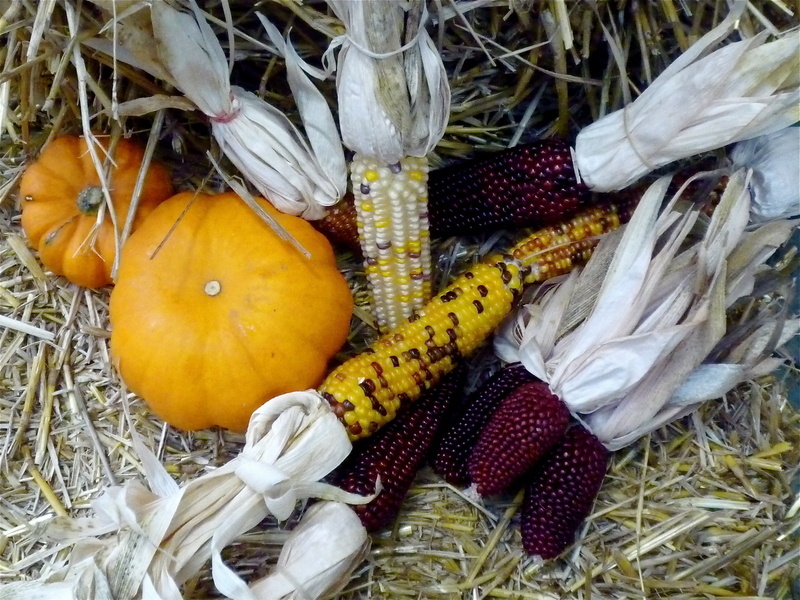 Bon Appétit and Welcome to Fall! I love swiss chard. It’s a popular green in late summer and fall and it makes a great accompaniment to roasted or braised meats. It’s very versatile (see the Swiss Chard Tart recipe I posted last year) but one of my favourite ways to enjoy it is simply braised in butter, garlic and a bit of stock. It’s simple to put together and only takes a few minutes. You don’t even have to dry the chard leaves after washing them. Any kind of swiss chard will work – green, red or rainbow chard. Bear in mind that when it cooks down, it reduces in volume significantly so you may have to make a double batch if serving a crowd. This is the perfect side dish to go with Braised Short Ribs, Oven Roasted Prime Rib, grilled steak, roast chicken or pork. Helpful Tip: Grating garlic cloves on a microplane will mince them quickly and easily without a mess. Trim large stems from the chard. Rinse the leaves well to ensure they are clean of all dirt and grit. Set chard leaves aside. In a large, deep skillet, heat butter on medium until just melted. Add garlic and cook for about 15 seconds. Add chard to pan. Use tongs or a couple of forks to toss the chard in the butter and garlic. Turn heat to medium-high and add stock. Cover and simmer for about 5 minutes, until leaves become limp. Uncover skillet. Let any remaining liquid cook off on medium-high heat. Season chard with salt and pepper to taste. Serve with your favourite dishes.